Medical marijuana is still in its introduction phase in the medical health industry. It is a potent product that is gaining mass acceptance globally, where Chinese medicines are already being manufactured by the use of these plants and that too with a long history associated. Medical marijuana remains a big influence in the healthcare industry to treat cases that are not completely advisable with traditional medicines. Medical marijuana is just a normal marijuana plant that is processed to get the actual composition of cannabinoids, which is required to synthesize the product to be in use. CBD is the main cannabinoid in use because of its zero-psychotic feeling as compared to others, but all the cannabionoids are generally calculated to form a specific medicine to treat disorders, which range from cancer, AIDS, multiple sclerosis, nerve damage, epilepsy, Parkinson’s disease, PTSD, anxiety, and arthritis, among others. The marijuana plant is of two types’ sativa and indica. The manufactures use any of the two to manufacture medicines, having different types of properties when exposed to the body. Medical marijuana is mostly found in two forms, dried and extract, which are synthesized from the dry leaves making it a more potent and vast option with many products manufactured using marijuana extract such as oil concentrate, tinctures, edibles, spray, and topical, among others. 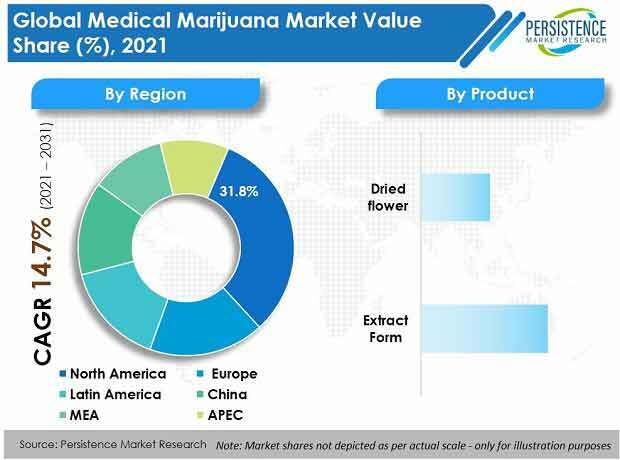 The global medical marijuana market is estimated to be worth US$ 12,209.9 Mn by 2018 end and is expected to expand at a CAGR of 15.9% over the forecast period of 2018 – 2026. North America accounted a large market share and was valued at US$ 3,538.7 Mn in 2017, and is expected to expand at a CAGR of 16.2% over the forecast period. The growth of the global medical marijuana is primarily driven by increasing prevalence of conditions that require medical marijuana for the treatment, rising geriatric population in need of treatment for chronic diseases, awareness programs conducted by public and private associations, and growing number of medical marijuana clubs, which promote the quality associated with medical marijuana. However, manufacturers on a global level are engaged in developing products that should get recognition in order to be in use for a greater population. The legalization of medical marijuana in developing countries is expected to drive the demand for medical marijuana as an alternative for traditional medicines. It makes the medical marijuana industry more accessible for the new players with fragmented company profiles, majority of them in situated in the U.S. and Canada. However, missing scientific cases for medical marijuana are confining the market to grow. Brand surge provides a positive share for the competitors to capture maximum market with already set distribution networks and regional space. Stringent FDA and other regulations are some of the factors expected to hamper the growth of the global medical marijuana market over the forecast period. Geographically, North America is expected to be the dominant regional market by 2018 end and is expected to expand at a CAGR of 16.2% over the forecast period. Europe is expected to be a lucrative market in terms of revenue growth in the global medical marijuana market, registering a CAGR of 17.4% over the forecast period. Examples of some of the key players in the global medical marijuana market included in this report are GW Pharmaceuticals PLC, MedReleaf Corporation, Canopy Growth Corporation, Aphria Incorporation, Aurora Cannabis Inc, Medical Marijuana, Inc., Green Relief Inc., Cannabis Sativa, INC., Insys Therapeutics, Inc., and The Peace Naturals Project.